We are so pleased to host a wine glass painting class at Ungrapeful Winery. The design for this class is called SUNFLOWER MASON JAR. Class will be under the instruction of Susan Daugherty on August 18, 2017 at 7:00 PM – 9:00 PM. We would request that you arrive at the winery at around 6 PM to have a leisurely free wine tasting. Our wines will be available for sale by the glass and by the bottle during this event. Be ready to have a great time! $20.00 + tax per person. Please be advised that at checkout go ahead and click on pay with Paypal. You do not need to have a Paypal account to finish the transaction. If you run into any trouble please give us a call at 724 675 8122. We are excited to host an event in collaboration with a fellow business in our town, Founders Gallery and Gifts. Join us at Ungrapeful Winery, on Friday, August 11, 2017, at 6:00 PM – 9:00 PM. This is a Pallet Painting class under the instruction of Founders Gallery and Gifts. Painting will begin at 7:00 PM. All supplies will be supplied to you. We suggest that you come in around 6 PM to have a more relaxed and enjoyable free wine tasting experience prior to the event. Wine will be available for purchase by the glass or by the bottle as well. Come prepared to have a great time. All participants for this event must be 21 or older. There are only 15 seats available for this event so don’t wait to reserve you seats. Band plays a mixture of Oldies, Classic Rock, Country, and Blues. Band plays a mixture of Blues, Soul, and Rock and Roll. Ungrapeful Winery is teaming up with Paint ‘N Sip for an exciting event perfect for this special day! 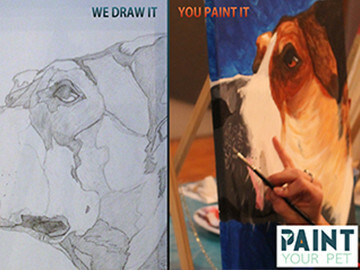 We will be painting “PAINT YOUR PET,” some elements may be pre-sketched on each individual canvas. FRIDAY, August 4, 2017. Painting will begin at 6pm. We will take a break during our event, and wrap things up around 8pm. To allow our artists adequate time to detail our guests’ pets, ticket sales will end July 21st at 11:59pm. Purchase your ticket online & save your ticket number(s). Email a picture of your pet (1 pet per person) to contact@thepaintnsip.com Include your name and ticket number in the body of your email. Our Artists will draw your pet onto a 16″x20″ canvas in a “paint-by-number” style several weeks in advance. On the day of the event we help you bring it to life using professional techniques. All art supplies and protective aprons will be supplied to you. Come prepared to laugh and have a great time!!! We suggest that you come in for free wine tasting about 30 minutes prior to the event. Wine will be available for purchase by the glass or by the bottle as well. There are only 12 seats available. RESERVE YOUR SEAT NOW!!! Band plays a mixture of Oldies and Rock and Roll. Band plays a variety of Dance Music, Classical, Country and Oldies. Tiger Lily – APRIL CLASS!!! Cherry Blossoms – FEBRUARY CLASS!!! Cardinals In Winter – JANUARY CLASS!! !